The action romance starring Chilean legend Marko Zaror explodes on Blu-ray in February. 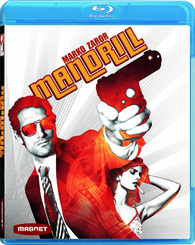 In an early announcement to retailers, Magnolia is working on 'Mandrill' for a Blu-ray release on February 28. From writer/director Ernesto Diaz Espinoza ('Mirageman,' 'Kiltro'), 'Mandrill' stars worldwide action icon Marko Zaror ('Mirageman,' 'Undisputed III: Redemption'), “one of the best martial arts actors working today” (Twitch). Hailed as “an amazingly cool film” (Film School Rejects), the thriller won top honors at its international premiere at Austin’s 2009 Fantastic Film Fest, winning Best Fantastic Feature and Zaror winning Best Fantastic Actor. Mixing breathtaking action sequences with sultry romance, 'Mandrill' centers on Antonio (Zaror), who is on a quest to avenge the murder of his parents. Working as a ruthless bounty hunter with the code name "Mandrill,” Antonio’s only weakness is women. Therefore, he enlists his uncle – an expert in the art of seduction – to give him the necessary skills to bewitch every female he meets. After Mandrill is enlisted to entrap a powerful casino owner, he discovers that this man is also the one responsible for his parents’ brutal deaths. Yet upon meeting the casino owner’s beautiful daughter Dominique, everything begins to unravel for Mandrill whose life-long search for vengeance may soon fall apart. Specs have yet to be revealed, but the Blu-ray will include a behind the scenes featurette and international trailer. You can find the latest specs for 'Mandrill' linked from our Blu-ray Release Schedule, where it's indexed under February 28.